The 590B Densimeter, when loaded with the Foal IgG Calibration, provides a quick and accurate onsite measurement of the foal's immunoglobulin G (IgG) level. This test utilizes a small sample of the foal's blood to determine the concentration of IgG present at the time of the test. 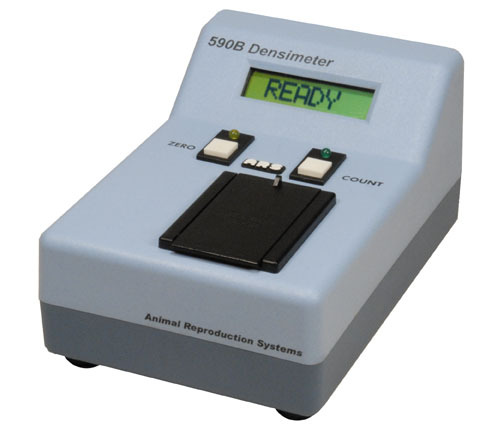 The 590B Densimeter provides an accurate numeric result (mg/dl) in approximately 15 minutes. There are no color change charts or need to estimate degree of agglutination with this test. The Foal IgG Analyzer Kit includes the 590B Densimeter listed above, foal IgG concentration calibration, and all equipment and supplies for 20 Foal IgG measurements. Each kit includes pre-filled measurement and dilution cuvettes which minimize onsite setup time and help insure accurate results. 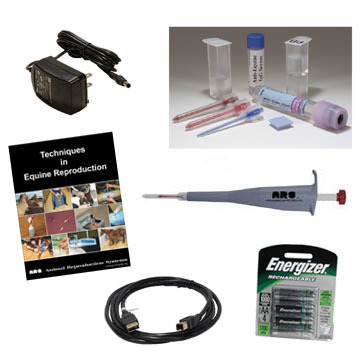 Additional Foal IgG Test Kits are sold in quantities of ten (10) and include all required supplies to perform the measurement. Testing Foal IgG with the 590B Densimeter should be done at a typical room temperature. If testing is to be done in a cold environment (below 10°C) the 591B Densimeter is recommended. ARS recommends that this test and treatment of foals with inadequate passive transfer be done under the supervision of their veterinarian. An IgG upgrade kit is available to add the IgG capability to a previously purchased 590a or 590B Densimeter..
ARS recommends that the Foal IgG Analyzer Kit be in transit no more than two (2) days. It has been shown that extended exposure to excessive heat may damage one of the kit components (the Anti-Equine IgG Serum). Please select the appropriate shipping method to meet the two (2) day recommendation. The customer should take into consideration the day of the week the product will be shipped when choosing a shipping method.